little cupcakes...and all the sweet little details to them. I wanted and stitched up the sides. crepe paper. I've been addicted to making it lately. to the one for the front of the pocket for dimension. time consuming but added some sweet detail. 5. I also added little images such as the mini rosebud and the hearts to the top of the pocket. This set has some of the most adorable little images! 6. Finish off the project by topping it off with some yummy May arts texture ribbon from here. Love it and will have to get more ..and a few buttons and mini roses..and I was done . Hope you have enjoyed my project! Who doesn't like a cupcake? Thanks for letting me share! This is beautiful! Great use for all those file folders laying around not getting any love. Love the jellie dot sprinkles on the cupcake!! Oh Cherry this is gorgeous! 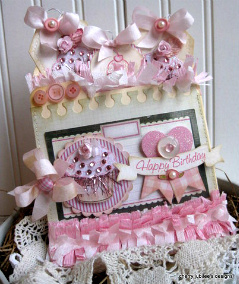 Love those yummy pink and cream frosting colors and sweet cupcakes! A Double Yummo from me!! So sweet! :) no pun intended of course! - this is really terrific!